This page is dedicated to groups of all kinds that draw folks together for spiritual and holistic purposes. It is advisable to contact the group facilitators before attending to confirm that the group is still running as set out below. We try our best to stay current with these groups, but sometimes they close and we don’t know about it. If you run into that situation yourself, please let us know so that we can keep this section current. 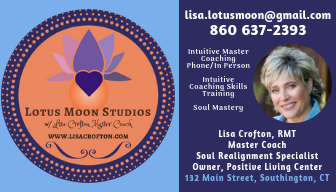 We are always looking for ways to connect the public to many different spiritual and holistic offerings. If you’d like your group listed here, please contact us! SOUTH WINDSOR – Unity of Greater Hartford hosts A Course In Miracles Study/Support Group on Mondays. Held weekly and hosted by Dale-Ann Lugrin & Willie Cancel. Whether you’ve been studying The Course for decades or just picked it up recently, this group experience will deepen your understanding and integrate the brilliant insights shared by Jesus, through Helen Schucman, the psychologist who reluctantly scribed the 1200+ page document. Unity Church, 919 Ellington Road (Rte 30) off Rte 5 | Exit 55 off I-84 East | Exit 4 off I-295. For more info, call (860) 289-8963, email us at: info@unityhartford.org or visit www.unityhartford.org. Mondays 7 to 8:30 p.m. NOTE: The Miracle Distribution Center in Fullerton, CA maintains a list of Course in Miracles groups throughout the world. The list can be obtained online at www.miraclecenter.org. If you have an existing group, be sure you are on their list and let us know, too! COLUMBIA – Gongs, Crystal Bowls, Brass Bowls, bells, drums and more! Sound Healing Meditation with H.U.S.H. Holistic Universal Sound Healing. Two monthly locations (see South Windsor listing as well). Join us for a harmonic vibrational journey! Held on the second Thursday of each month, 6:30 pm. Call or email for pricing, location, to be put on the email list or to reserve your space. Linda and Peter Jacques, bewell444@gmail.com, (860) 428-2097. Visit website at www.wholenesswithlinda.com. EAST HARTFORD – Jam Sessions at Vibrational Healing Center We will create new sounds with drums, singing bowls and voices. We will journey to the sound of Omm as sounded by voice and bowl. There will be healings, meditations and new experiences. Bring your own instrument or borrow one of mine. Every third Wednesday from 7 to 8:30 p.m. Hosted by Marie Menut at the Vibrational Healing Center, 966 Tolland Street, East Hartford, CT. Call for info and to say you’re coming: (860) 508-8219. Donations appreciated. SOUTH WINDSOR – Gongs, Crystal Bowls, Brass Bowls, bells, drums and more! Sound Healing Meditation with H.U.S.H. Holistic Universal Sound Healing. Two monthly locations (see Columbia listing as well). Join us for a harmonic vibrational journey! Held on the third Friday of each month, 7 p.m. at Unity Church, 919 Ellington Road. Call or email for pricing, location, to be put on the email list or to reserve your space. 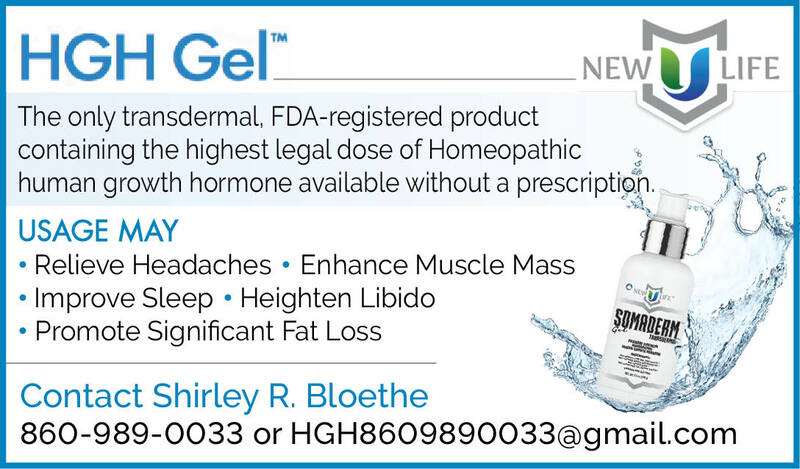 Linda and Peter Jacques, bewell444@gmail.com, (860) 428-2097. Visit website at www.wholenesswithlinda.com. SUFFIELD – Unicorn Meadow Farm Drum Circle led by Lynne Hartwell. Usually held the second Monday of every month at Unicorn Meadow Farm, 1349 Spruce St, Suffield, CT from 7 to 9 p.m. No previous musical experience required. This is a mixed group of drummers where beginners can join in with more experienced drummers in a relaxed and welcoming environment. Lynne will help guide the circle, and encourage participants in trying different rhythms, singing, etc. There is no obligation to doing this however, you can simply come and enjoy the event. This is a year round rain or shine event. During the warmer months we will be outside around the fire, weather permitting. Otherwise we will be indoors. No drum? No problem. We have drums and other percussion instruments available. Please check website at www.unicornmeadowfarm.com to verify date and any updated info. To register please call (860) 668-6424 or email k9koral@yahoo.com. NORWALK – Angelic Healing Touch Center For Reiki. Various Reiki Healing circles for Reiki Practitioners are held each month. They meet on various days. For more information, call Gigi Benanti, BA, Certified Reiki Master. Held at 7 Morgan Ave., Norwalk, CT. Call ahead at (203) 852-1150; no drop-ins. NORWALK – Reiki Healing Circle and Exchange is held on the first Thursday of the month at the Unity Center, 3 Main Street, Norwalk from 7 to 9 p.m. For more information, visit www.unitycenternorwalk.org. CANTON – Epiphany – Free Healings. Awaken to the value of integrative therapies. Complimentary sessions are offered by volunteers who are qualified, certified, and/or licensed practitioners. CranioSacral Therapy Therapeutic Touch, Reflexology, and Reiki are available at both locations. Therapies vary depending on the therapists available. Canton Epiphany may include Therapeutic Touch, Reflexology, CranioSacral Therapy, Healing Touch, Access Bars, Reiki, Guided Imagery and more. Sessions are 20 min and may decrease stress, pain, anxiety, accelerate healing, and enhance sense of well-being and learning skills. Children are welcome. These sessions are offered to the public on the second Wednesday of the month (except January, February and July). Epiphany is held at 225 Commerce Drive at FAVARH from 6 to 8:30 p.m. No appointment needed. Call (860) 693-8040 for further information or see www.iahp.com/Karen-R-Kramer. Any practitioners desiring to join us, please call Karen at (860) 693-8040. GLASTONBURY – Healing in Harmony Stop by the center for a FREE healing service. Participants will sit individually with a healer and receive an 8 – 10 minute healing. No reservation required. You will be served in the order in which you enter the center. The healing services are offered one night each month. 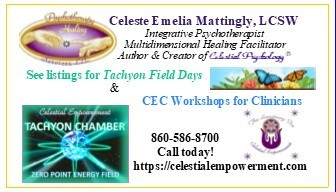 For information, please call (860) 430-9801 or visit www.healinginharmonycenter.com. Held at the Healing in Harmony Center, 99 Citizens Drive on Wednesdays, August 10. Time: 5 to 7 p.m. Cost: Free. SOUTH WINDSOR – Unity Church of Greater Hartford Held weekly – Wednesday Night Healing Service and hosted by Unity Prayer Chaplains. Unity’s Healing Service is a sacred time to share, meditate, give/receive energy healing, release the past, and connect with others in our beautiful Sanctuary. Unity Church, 919 Ellington Road (Rte 30) off Rte 5 | Exit 55 off I-84 East | Exit 4 off I-295. For more info, call (860) 289-8963, email us at: info@unityhartford.org or visit www.unityhartford.org. Time: 7 p.m., followed by tea and conversation. Holistic practitioner group meetings are opportunities for area practitioners to come together informally to network, share experiences and create community. Groups e-mail notices of events, so send your e-mail address to the coordinator. Groups are easy to setup and require minimum effort to coordinate. If you would like to start a group in your town contact Jon Roe (860) 875-4101 or jon.roe@comcast.net for suggestions. ENFIELD – First Monday breakfast: September 5, October 3, November 7, December 5 at the former Friday Windsor Breakfast will meet at The Country Diner, 111 Hazard Avenue (Route 190) in Enfield from 9 to 11:30. Coordinator: NANCY ALLEN at (860) 668-6424, k9koral@yahoo.com. FAIRFIELD – Third Wednesday breakfast: August 17, September 21, October 19, November 16, December 21, at Total Life Care Center, 60 Katonah Drive, from 8:30 to 10 a.m. To RSVP contact Laura at (203) 275-8077 or laura@tlcfairfield.com. NORWALK – First Tuesday breakfast: September 6, October 4, November 1, December 6, at Total Life Care Center, 152 East Ave., just off I 95 Exit 16, from 8:30 to 10 a.m. To RSVP: (203) 853-4852, TLCCenter@aol.com. VERNON/MANCHESTER – Third Friday breakfast: August 19, September 16, October 21, November 18, December 16 from 9 to 11 a.m. at Mitchell’s Restaurant, 1237 Hartford Turnpike (Route 30) in Vernon. Coordinator: JON ROE at (860) 875-4101, jon.roe@comcast.net. AVON – Hartford Hospital Grief Support Group – Grief is a difficult and confusing journey. No two individuals grieve in quite the same way. It is important to have support and understanding along the way. Come be with us and let us give you comfort. New time and location. 2016: Mondays, August 15, September 19, October 17, November 21, December 19 – held from 6:30 to 8 p.m. at the Hartford Hospital Family Health Center, 339 Albany Turnpike (Rte 44), Avon, CT. Registration encouraged at (860) 545-1888 but walk-ins are welcome. Free. For more information, contact Dory Dzinski at (860) 693-2840 or dorydzinski@comcast.net. AVON – Hartford Hospital Divorced Womens Empowerment Group – Finding yourself alone again can be unsettling when so much has changed in your life. Join others who are single again due to divorce and learn tips for self esteem, coping mechanisms, discovering your individuality, and have some fun and companionship. New time and location for 2016: Tuesdays, August 16, September 27, October 11, November 15, December 6 – held from 6:30 to 8 p.m. at the Hartford Hospital Family Health Center, 339 Albany Turnpike (Rte 44), Avon, CT. Registration encouraged at (860) 545-1888 but walk-ins are welcome. Free. For more information, contact Dory Dzinski at (860) 693-2840 or dorydzinski@comcast.net. GLASTONBURY – Beginner Gemstone Therapy Study Group (ongoing monthly) – sponsored by Isabelle Morton of the Gemstone Therapy Institute/The Healing in Harmony Center. The Gemstone Therapy Study Group is ideal for those who are interested in learning how to work with gemstones to awaken their innate self-healing abilities and to resolve the energetic causes of disharmony in their life. It is also a good start for energy workers who are interested in incorporating gemstones into their practice. Each study group session will open with a guided visualization, a group aura clearing using GEMFormulas’ gemstone energy aura sprays, then exercises for enhancing energy awareness, followed by a lecture and demonstration on the topic of the day. Students will get hands on experience wearing and working with the gemstones. Time: 7 to 8:30 p.m. Cost: $20 in advance, $25 at the door. To register and view study group topics, please visit http://bit.ly/1PjVYwz or call 860-646-3063 or email education@gemformulas.com. HOLISTIC MOMS NETWORK – National non-profit organization for parents with an interest in holistic health and green living. Visit www.holisticmoms.org to find a local chapter. PREMA MEDITATION – Meditation and stress reduction training for beginners and experienced meditators. Proven Western approach to the Eastern art of meditation. Learn and practice techniques to quiet the mind, induce spiritual awareness and tune into the divinity within. Introductory and intermediate/advanced courses. For further information and dates, contact Norm Green at (860) 875-6303 or norman. green@snet.net. Visit our web site: www.premameditation.org. SCIENCE OF SPIRITUALITY – Meditation on the inner Light and Sound of God. For information on classes, workshops, retreats, study groups for meditation, and spirituality, call (860) 487-3597. Programs are held under the guidance of sant Rajinder Singh Ji Maharaj and are always free. For complete list of upcoming programs, check www.newengsos.org or call us. FARMINGTON – Prayer and Healing Circle – For those of any religion or spiritual practice who wish to join with others sitting in healing prayer. For those whose need is to receive healing. Mondays 7:15 to 8 p.m. Call for further information or directions. Organizer: Sherry Osadchey, 780 Farmington Avenue, Farmington, CT 06032. Phone: (860) 677-5300. HARTFORD – Shambhala Meditation Group – Held at 144 Quaker Lane, Hartford, CT. Free instruction in mindfulnessawareness meditation. Please contact us for more information – contact: Hartford Shambhala Info at (860) 571-3766 or visit http://www.shambhala.org/centers/hartford/. MIDDLETOWN – Tibetan Singing Bowl Meditation Group – Meets on the 2nd Sunday of every month from 11 a.m. to 12 noon. Listen and Meditate to the wonderful sounds of one of the best collections of Antique Tibetan Singing Bowls in the country played by a master of the craft. Beginners to advanced welcome. Door closes at 11:25 sharp so don’t be late! Cost $5. Knight People/Temple Sounds in Middletown. See Listers or go to www.templesounds.net for more info. MIDDLETOWN – WESLEYAN – Zen Meditation Sessions – Every Sunday, 10:30 to 11:15 a.m. Meditation session includes incense offering ceremony, chanting the Heart Sutra in English, chanting Om Mani Padme Hum and quiet sitting meditation, followed by a Shin Buddhist service with the Buddhist Faith Fellowship of CT with dharma discussion. Come to one or both events. Meditation held at Memorial Chapel, High St., Wesleyan University, Middletown, CT. (860) 529-2933 or www.bffct.org. VERNON – Meditation Sessions with Clare Vidich held on the first Tuesdays – 6:30 p.m. – The Beyond Center, Suite G-5, Vernon Professional Building, 281 Hartford Tnpk. For more information call (860) 456-6766. Cost: Free. WEST HARTFORD, STORRS, VERNON, WILLIMANTIC – Free Jyoti Meditation Group – Practice a simple meditation technique designed to help participants invert their attention and connect with their inner spiritual Light. Meditation has many practical benefits, helping to reduce stress and stress-related illness, improve concentration, and awaken us to our spiritual nature. In meditation, we withdraw our attention from the senses and world around us and focus within to connect with our inner Light. Please join us if you are interested in meditation and spirituality. For more information, contact (860) 487-3597. WEST HARTFORD – Meditation Sessions with Clare Vidich are held on first Fridays – 7 p.m. – Elmwood Community Center, 1106 New Britain Avenue. For more information call (860) 456-6766. Cost: Free. WEST HARTFORD – Guided Meditations for Peace. Center for Serenity, Inc., 90 North Main St., West Hartford. All are welcome. Cost: Free, but donations are welcome. For information call (860) 561-2343, www.centerforserenity.org. WILLIMANTIC – Meditation at Windham Hospital – Held on the second Wednesday of the month. Meditation with Clare Vidich at the Women’s Center for Health, 7A Ledgebrook Drive, Mansfield Center, CT (behind the East Brook Mall). For more information call (860) 456-6766. Time: 6:30 p.m. Cost: Free. NEW HARTFORD – Mediumship Development Circle at Dragonfly Healing Arts, 8 Wickett Street, New Hartford, CT, facilitated by Sharon Farber; LMT, healer, artist and medium. Wednesdays from 7:30 to 9 p.m., suggested donation: $10. The focus of this Circle, which began in 2012, is to help participants develop their evidential mediumship. All levels of experience are welcome, but a beginner level mediumship class and/or personal mediumship experience is beneficial. We invite guests to attend circle and receive connections on the first Wednesday of each month. For more information, visit www.dragonflyhealingarts.net. Contact Sharon if you are interested. (860) 989-2358 or sharon@sharonfarber.net. SPIRITUAL EXPERIENCES DISCUSSION GROUP – Free gatherings. Share your stories and experiences about profound dream, out of body, inner sound, divine love, soul travel, presence of an angel or spiritual master, inner light, inner guidance, coincidence, knowingness, deja vu, and past life recall. Learn techniques to find deeper meaning in your experiences and how to have more of them. Sponsored by Eckankar. Visit our website for dates, times and locations at www.ct-eckankar.org. FARMINGTON – Near Death Experiences Group – support groups for those who have had a near death experience or are interested in hearing about the topic. Meets the 2nd Monday of each month from 7 to 9 p.m. at the UConn Health Center, HR Training Room at 16 Munson Road. For info contact Jack or Walt at jackart31@ aol.com or wallyrocks160@gmail.com. After entering the main entrance, the conference room is the first door on the right. Parking is available in front of the building.